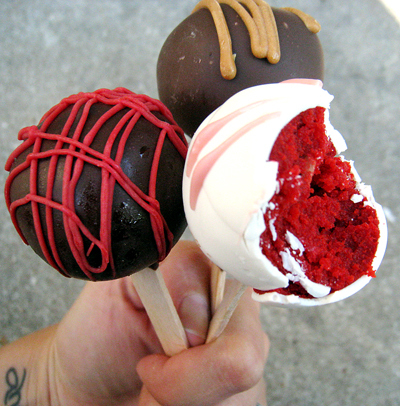 If you haven't already, you simply must try a cakeball! This delicious petite creation is all the rage right now and is the perfect dessert/party favor for bridal showers or any sort of party shower...except actual showers, that'd be gross. If you live in the Greensboro, High Point, Winston Salem area, check out Yummy Goodness Bake Shoppe. They make great varities, including the 4 I listed above! Or if you like to try baking things on your own, which I LOVE to do, here is a website I found with several different flavor recipes. I am not lying to you folks, if you serve these at your next party people will think you are a genius. It was all anyone talked about at the bridal shower I went to last Saturday. If they haven't come to a bakery near you yet, try baking them soon. The red velvet flavor featured here would be the perfect treat for your lover on Valentine's Day. However, I suggest including an alternate white chocolate coating with the milk chocolate, because that's a more Valentine's-y color combo.